Comfortable and complete cover for every pore. 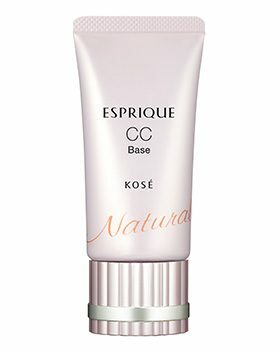 A CC makeup base that thoroughly covers large and darkened pores, creating smooth and even skin that lasts all day. Choose from two types for your preferred ﬁnish “Natural” type blends smoothly to create a finish that feels as natural as bare skin. “Cover” type neatly covers uneven color and dullness, creating a bright and one-tone finish. Spreads pleasantly like an essence, caring for pores while creating supple skin. “Pore Care Ingredient” mends roughness and has a soft-focus effect. “Darkened Pore Cover Powder” tackles all darkened pores with reﬂected light. “Tone Boosting Polymer” protects moisture while leading to smooth and velvety skin. Improves the spread and hold of foundation, and ensures poreless ﬁnish is long-lasting. SPF50+/PA++++ Protects skin with powerful UV ray-blocking effect, and prevents dark spots and freckles due to the sun. *Not a guarantee that skin irritation will not occur in all individuals. *Based on KOSÉ research. Individual results may vary. Take a small amount onto a fingertip and apply evenly to entire face. (Spread thinly around nostrils, eyes and mouth. If application is too thick it can cause foundation to become uneven.